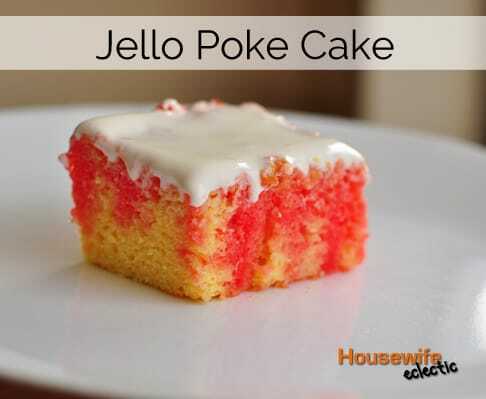 I am not usually a huge cake fan, but there is something about the cool, refreshing flavor of Jello Poke Cake that I can’t get enough of. My mom used to make this for me growing up and I haven’t had it in years. I decided it was time for my little girl to try one of my childhood favorites. 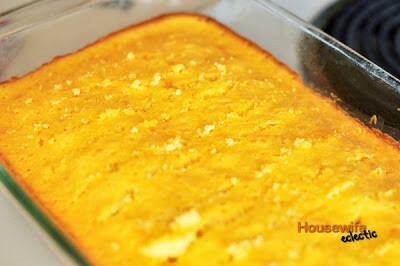 Bake your cake in a 9×13 pan according to the box directions. Allow to cool for at least 20 minutes. Poke holes in the cake with the fork, across the whole cake. Add 1 cup of boiling water to the Jello and stir until dissolved. Stir in 1/2 cup of cold water. Pour the Jello mixture over the the entire cake. Refrigerate the cake for 3 hours, until the Jello is set. Top with whipped topping. You can use any Jello flavor you want, I personally used Strawberry Jello and yellow cake mix. The delicious dessert requires some prep time, but comes together really easy and it is a fun crowd pleaser. So simple and sounds yummy! Definitely will need to try this out. My mom used to make this! Makes a pretty cake. Oh I have had this before and love it – yum!